By Scott Gilfoid: Andre ‘SOG’ Ward basically ended any chance of getting a fight against the loud-talking Tony Bellew by reportedly letting him know that for him to have a chance of facing him, he needs to BEAT the winner of the unification fight between WBC/WBO cruiserweight champion Oleksandr Usyk and IBF/WBA champion Murat Gassiev. If Bellew (30-2-1, 20 KOs) can beat the winner of that fight, then he can potentially face the unbeaten 34-year-old Ward (32-0, 16 KOs). Well, I hate to say it but Bellew is likely not going to go anywhere near Usyk or Gassiev, as those guys can actually fight. There’s not old, injured, inactive and over-the-hill like Bellew’s last opponent David Haye, and they’ve not been given a high ranking based on wins over fluff opposition like Illunga Makabu. Unfortunately, I don’t see Bellew taking the fight against the Usyk vs. Gassiev winner, because he appears to be looking for a cash out fight, which is exactly what Ward is saying. I suspect that Bellew will now go quiet and give up on a fight against Ward entirely, because he’s not going to go anywhere near Usyk and Gassiev. That’s not happening in this lifetime. Heck, Bellew wouldn’t even face Mairis Briedis. When Bellew was still the WBC cruiserweight champion, he went out of his way NOT to fight Briedis by taking on bottom dweller fringe contender BJ Flores. I totally agree with Ward. I think Bellew is just looking for a cash out fight to help feather his retirement years. 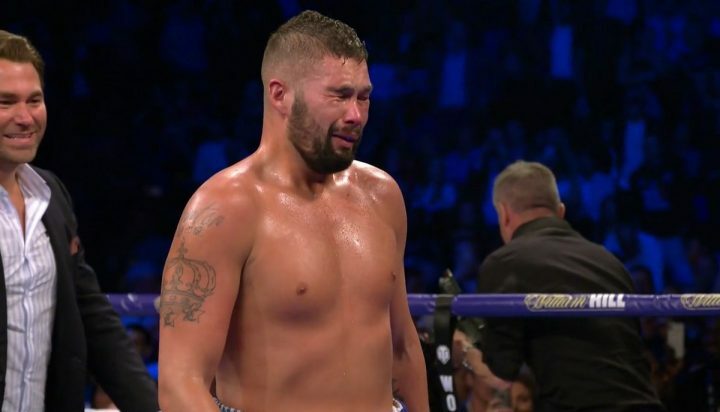 If he Bellew was actually trying to accomplish something in terms of the sport, he would go back down to cruiserweight to face Gassiev, Usyk, Yunier Dorticos or Mairis Briedis. Bellew has mentioned wanting to fight the winner of the Usyk-Gassiev fight, but not nearly as often as wanting to fight Ward or former heavyweight champion Tyson Fury. That’s the guy that Bellew has been working REAL hard at trying to get to face him at the end of 2018. Fury even said that he would face Bellew if he wants it, but he might not have been serious. Fury likely won’t take the fight because Bellew is too defense, and he’s not going to want to have to chase him around the ring for 12 rounds. Fury is still 30 lbs. overweigh at 276 lbs. He’s way too fat to be fighting a guy like Bellew. The hard-hitting Gassiev would likely destroy Bellew and send him into retirement straightaway. Gassiev would not only beat Bellew, he would make a real mess of him and give him a bad beating. Gassiev has one-punch power, and a very good chin. The punches from Bellew that were hurting Haye in their rematch on May 5th would bounce off the chin of Gassiev, who would walk through those shots and then take him out with a body or head shot.